Hope everyone is having a nice summer so far. I've received several reader suggestions over the past few weeks of Gainesville area restaurants to check out. Please keep these ideas coming. On with two quick reviews and then some thoughts on an article in the latest issue of Gainesville magazine. Great Outdoors Restaurant: At the suggestion of a reader, we headed up the road to downtown High Springs to check out Great Outdoors Restaurant a few Friday evenings ago. The place was packed when we arrived, and being my normal impatient self, we decided to eat up at the bar on the outside patio (the outside fireplace is a nice touch). The waitstaff was clearly shorthanded and service was forgettable. On the plus side, we enjoyed our selection of appetizers (sugar cane steak sticks, black and tan rings and fire cracker wings) and choice of beer (the restaurant's own Tail-Gator pilsner). The wings were large and meaty and the steak skewers were juicy and tender. The menu seemed priced to the high side (easy to spend twenty-thirty bucks a head), but then the place was packed so what do I know. A mix of appetizers and beer worked for us. The night of our visit the entertainment had been canceled due to the threat of rain, but it looks like live music generally runs Thursday through Sunday. The Green Mango: After several months of passing by the Green Mango and hearing about it from several people, we decided to give this little take-out only, vegetarian only Indian restaurant a try. I wanted to like the place, but unfortunately the food was very average and the prices higher than we expected. I ordered the palak paneer curry and Traci tried the aloo mattar curry. We both agreed that the best part of our meals were the samosas. Less rice and more of the curry would have been appreciated. If you decide to give Green Mango a try definitely call in your order to help lessen the wait. For my taste and money, I prefer Indian Cuisine. For the same price that we spent on a take-out meal at Green Mango, we could have enjoyed the nicely prepared lunch buffet at Indian Cuisine. Best Local Burger in Town: The latest issue of Gainesville magazine has a feature about the perfect burger (The article doesn't seem to be online yet or I would link to it). Recipes for burgers are provided by several local restaurants - New Deal Cafe, Bev's Burger's and Buddha Belly - all of which we've dined at at least once. The burger at New Deal Cafe is definitely a winner. For a fast-food style burger, Bev's is also a good choice, as is Mac's Drive Thru. I can't say I think of burgers when I go to Buddha Belly- the curry and fried rice are the mainstays. If you're into nostalgia, Louis' Lunch is worth checking out (a warning that you'll likely either really like or dislike their burgers. I find them enjoyably unique). Copper Monkey also does a good burger. So what's your favorite Gainesville-area burger? As usual lately, this post is long overdue. Thanks to the combination of a helpful reader e-mail and a brief pause in school-related deadlines, I wanted to weigh in with some quick updates on the food scene in and around Gainesville. As usual, please e-mail me with suggestions of new places to try. TooJay's: While I don't normally write about the opening of new chain restaurants in town, TooJay's Gourmet is worth making an exception for. TooJay's opened a few weeks ago in Butler Plaza close to the interse ction of Archer and 34th in the old Rafferty's location. I've long complained about the lack of a really good deli/sandwich shop in Gainesville (Hogan's doesn't do the trick for us). My first introduction to TooJay's was when I lived in Orlando. If you like deli style fare (and baked goodies), then TJ's will likely be up your alley. Big menu and good sized portions at reasonable prices (much of the menu is under ten bucks). Apparently, we're not the only ones who are TJ's fans, as there have been lines nearly out the door on our two visits. We endured the lines twice and bailed a third time. Bev's Better Burgers: Maybe a month or so ago on a Saturday we checked out Bev's Better Burgers up in Alachua on the suggestion of a reader. Bev's is a classic greasy burger joint that does walk-up business and drive-thru. The weather was nice that day so we decided to walk-up and eat at one of the old picnic tables out front. I ordered a cheeseburger and onion rings and Traci went with a hamburger and fries. We both enjoyed the greasy goodness. 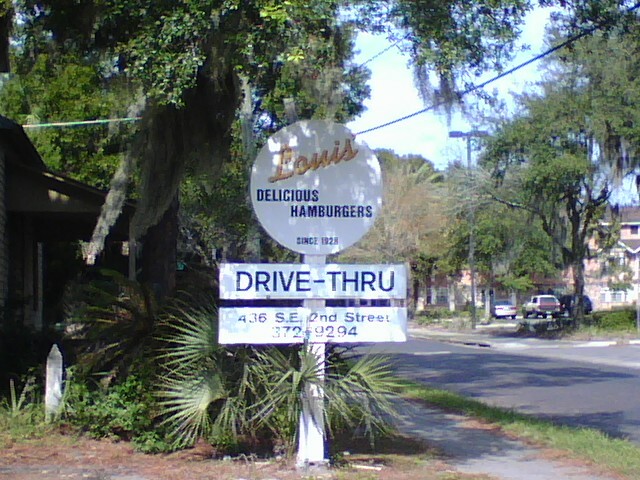 If I had to rank Bev's against other independent fast-food burger joints, I'd put Bev's ahead of Ralph's Burger House in Chiefland, but behind Mac's Drive Thru in Gainesville. Traci says she would take Five Guys over all of them (see, we're becoming shills for the chains). For pure nostalgia, I still think Louis' Lunch is worth a visit. Ti Amo! : As part of an early Valentine's present, we decided to check out Ti Amo, a relatively new upscale Mediterranean-styled restaurant located downtown (because nothing goes together like a nice meal and then seeing Old Crow Medicine Show). Ti Amo! shares the same owner as Mildred's and New Deal Cafe (the group's committment to local ingredients is laudable). I continue to think New Deal is one of the best values in town. As for Ti Amo, the unique twist to the restaurant is its interesting mix of tasting plates (think tapas style). Full sized entrees are also available. Ti Amo is set in a beautiful location and overall we had a good meal (the roasted Georgia quail with stuffing was knockout). We felt like we had escaped to a big city for a while. A good date or special occasion place. On a side note, does anyone really think David's has some of the best barbecue in town? After a lackluster meal there when we first moved here two years ago, we gave David's another try recently - same result. Mediocre food. The best thing about David's maybe the radio jingle ("Everybody loves David's barbecue.."). On the other hand, a recent return visit to Adam's Ribs was a good experience. That's all for now. Thanks for reading. PhD life this semester has kept me pretty jammed, but that's not a good enough excuse for not updating the blog. Hopefully, this post will get me back into the swing of things. In recent months, we've continued to frequent many of our favorite local restaurants, as well as tried a few places for the first time. What follows are several round-ups. As always, drop me a line with places to check out or post below. For anyone still wondering, our dinner (many months ago now) at the newly opened Commander's Palace location in Destin was overall an enjoyable experience. The food was top notch and the view is stunning. As for the service, the new location has lots of work to do to match the original in New Orleans. We also tried McGuire's Irish Pub while we were in town and had a good meal. McGuire's may be touristy, but I liked it, particularly the upstairs deck. Sweet Dreams: This may be my favorite local ice cream shop of all time. It's really been in the past year that we discovered Sweet Dreams and it has become a regular "reward." These folks make some of the most delicious ice cream you'll ever taste. Traci's favorite flavor is the Mojito ice. As for me, I try a new flavor each time. A winning combination that won't break the wallet is doing New Deal for dinner and then walking down to Sweet Dreams for dessert. Speaking of New Deal, have you ever talked up a restaurant, then gone to the place with some friends and it let you down? Such was the case with New Deal about a month or so ago. Our meals were pretty mediocre and I'm sure our guest was wondering what we had been thinking. In New Deal's defense, the back room that night had a private party so the kitchen and wait staff was jammed. On the other hand, we took this same guest to Blue Highway Pizzeria in Micanopy and had a fantastic meal. 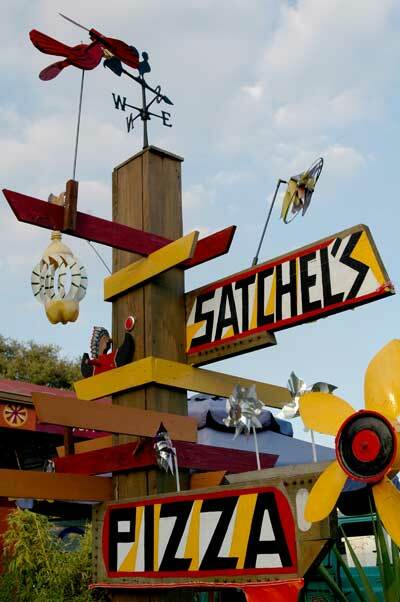 Outside of Satchel's, this is the best pizza in town. Random tips from strangers on restaurants to check out are generally hit-or-miss, but sometimes you just get a feeling the person knows what they're talking about. So on a hunch, and looking to explore outside of Gainesville one weekend (call us crazy, but we generally enjoy visting these little towns), we set off to find Ralph's Burger House in Chiefland. I'm not sure that we would make the drive again just for the Burger House, but they certainly make a dripping-good burger. The onion rings and fries were also winners. If you've been to Mac's Drive Thru here in Gainesville, then you'll feel at home with Ralph's. It feels good to support these old-time fast-food joints and it's a taste and experience you can't get at burger chains. That's all for now. Again, hopefully this post will get me back into a more regular posting schedule. Thanks for reading and have a Happy Thanksgiving. The summer certainly seems to be flying by. I still can't believe we've lived in Gainesville for a year now, although this place certainly has felt like home for many months. As you might expect, over the past few weeks we've revisited several restaurants we've been to before, as well as tried some new ones. Below are quick reports on several of them. As always, drop me a line with Gainesville area restaurants to check out. On a bit of a whim, we took a day trip to Amelia Island/Fernandina Beach last week. Before hitting the road, I looked up restaurant recommendations on Chowhound and came across T-Rays Burger Station. It sounded like the kind of local diner/dive that would be right up our alley. From the outside T-Rays still looks very much like an old gas station because it is or was (the pumps don't seem to work anymore). We arrived as T-Rays was changing over from its breakfast to lunch menu. Locals sitting patiently waiting was a good sign. Once T-Rays opened for lunch, I ordered a special of the day, shrimp salad on a hoagie roll. Traci had a burger. Our meals were tasty, the price was right, and for being first-timers, the service was certainly friendly. Chalk it up as a good little find. The picture below is of T-Rays (impressive, huh?). The weekend before last, we decided to celebrate Traci's new job by driving out to Blue Water Bay in Melrose for dinner. Our one previous visit for brunch a few months ago had been very enjoyable. This time I wanted to check out their well-known seafood buffet and Traci was in the mood for a steak. To speed up our wait (I'd guess we spent at least 30-40 minutes waiting for a table), we decided to grab the first two available seats at the bar (we actually like the feel of this side room with its rustic Florida decor more than the main room). Next thing we knew, we were accidentally chatting with Byron Terwillegar, the owner and head chef at Blue Water Bay, who was sitting a few seats over. Needless to say, we had a great meal and I enjoyed talking food with Byron. For special occasions or when you just want to treat yourself, Blue Water Bay and Mark's Prime are tops on my list. Now on to a not so stellar meal. This past weekend, we were in the mood for Asian of the non-takeout and non-buffet variety and Chopstix Cafe on 13th St. seemed to fit the bill. Our one previous visit to Chopstix had been a fair to good experience overall, although I can't say I fully understood even then why lots of people seem to get excited about the place. After our second visit this past weekend, I'm further confused. Granted, the view of Biven's Arm Lake is great and the prices are very reasonable. The food on the other hand, to me at least, just tastes average, the service is mediocre and the place is fairly run-down (call me crazy, but I feel cleaner in La Tienda). On this visit I tried the spicy duck soup and Traci went with a bowl of Thai-style noodles (I forget the her particular entree). For appetizers we ordered chicken satay and bo cuon (rice angel hair noodles, thin sliced beef and lettuce wrapped rice). Unfortunately, nothing really stood out for us. In other news, I received an email yesterday that a new Northern Italian-style restaurant called Francesca's Trattoria is slated to open in the coming days. The opening could come as soon as next Monday. For more information, check out Francesca's website and consider signing up for its VIP list. In the interest of full disclosure, I'm friends with Dave Khey, whose family is opening up the restaurant. I've always enjoyed talking restaurants with Dave and since I really don't have a go-to Italian restaurant in town, I'm looking forward to trying Francesca's. So what's your favorite local, sit-down Italian restaurant (this doesn't mean pizza joints like Satchel's and Blue Highway)? That's all for now. The picture above is of sunset last week at Amelia Island. Enjoy your summer. The summer break has meant a little more time for eating out and exploring more restaurants in and around Gainesville. We also got over to Tampa for a day last weekend. On with the latest updates. The Top: Believe it or not, we've lived in Gainesville for about a year now and haven't been to The Top. Pretty bad, huh? Thanks to encouragement from Lynn and Tim, we had our first meal at The Top last week. I now understand why The Top's sweet potato fries have a cult following - simply delicious. Lynn also turned us onto the corn fritters, which even topped the sweet potato fries. Traci and I both went with burgers. I was warned in advance about the hipster servers at The Top and had the opportunity to experience their indifference first hand (I think I was very nice in requesting a correction to my order, but I digress). Overall, though, it was a good experience (I particularly like the funky vibe of the place) and will likely try The Top again for drinks, dinner or a combo of the two. Pei Wei Asian Diner: Anyone who has read this blog for a while knows that I focus most of my efforts on supporting independent, local restaurants rather than chains when I can help it. This isn't to say that there aren't some quality chains out there (Chipotle comes to mind). Last weekend, before heading back to Gainesville, we had an early dinner at a Pei Wei in Tampa. Pei Wei shares the same owner as P.F. Chang's. Traci's sister in Texas had raved about Pei Wei. The set-up is fast-casual style (order up at a counter and the server brings out your order). The look and feel of the place is similar to a P.F. Chang's. The menu is an interesting selection of salads, noodle bowls and rice bowls. Traci ordered blazing noodles with chicken and I ordered the Pei Wei pad thai with chicken. We both liked our choices and the servings were big enough to have food to take home. The bill came to under twenty bucks for the two of us. Not bad. I can see why Pei Wei is a hit. Mac's Drive Thru: Again, thanks to encouragement from Lynn, we tried another long-time Gainesville restaurant for the first time today for lunch. I also still have a list I printed out from Gainesville.com nearly a year ago of "best restaurants" in town which has Mac's on it. Mac's was everything that Sandwich Inn wasn't - great greasy burgers and fries (and I mean this in the best way) and solid service at a good price. I now understand firsthand why this old double drive-thru always has long lines around lunch time. For nostalgia, I still don't think you can't beat sitting down at the counter and having a burger at Louis' Lunch. In terms of taste, my favorite burger in town right now is from New Deal. Of course, Mac's and Louis' are more in the neighborhood "diner and dives" category, while New Deal is decidedly a cafe. Copper Monkey also does a quality burger. That's all for now. As always, drop me a line about the Gainesville food scene and beyond. Another long overdue post as I emerge from the salt mines of PhD life for a few minutes...I feel like we've been on a bit of a cold streak the past two months in finding good new restaurants to add to our regular rotation. So if you have a favorite that I haven't tried yet and reviewed here, please drop me a line. Our new fave by far is Buddha Belly, which we've now been to three times in a month or so. Buddha Belly's curry isn't really Indian-style per se, but tasty nonetheless. Other casual, local spots we continue to visit include Green Plantains (still my fave for local Latin food), La Tienda (authentic Mexican, no frills! ), La Fiesta (solid tex-Mex), Louis' Lunch (crunchy burgers, and I mean that in a good way, with tons of tradition), Falafel King (the food is okay, but the service always seems annoyed), Adam's Rib Co. (solid barbecue, sit up at the counter), Satchel's (has turned pizza into an art), Blue Highway Pizza (they're not Satchel's, but also high quality) and Pearl Country Store (a nice change of pace). Sandwich Inn: Not sure what I can say positive about this place. I was told this was a good choice for tasty, cheap burgers and fries. I liked the looks of the place. Semi-run down, old school, double drive thru. Sandwich Inn is located near the corner of N. Main and NE 16th Ave. I figured a place wouldn't stay open this long if the food wasn't good? At least on our visit, the food was very forgettable. Traci and I both ordered burgers and fries. Service was gruff to put it nicely. The burgers were big and sloppy (both good things! ), but there wasn't much flavor to the beef and the fries were forgettable. For an old-school burger place, I certainly prefer Louis' Lunch- pretty good food and not bad service either. 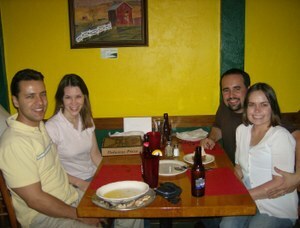 Leonardo's Pizza of Millhopper: The combination of curiosity and a coupon lured us into this Leo's. When we first moved to town, we ate at Leo's By the Slice and Leonardo's 706 and didn't understand the mystique of either. As I understand it, the Leo's at Millhopper hasn't been affiliated with the other two for many years. We ordered a deep dish pizza, the signature item at Leo's at Millhopper, a pitcher of beer and garlic rolls. The garlic rolls looked promising (drenched in garlic and melted butter), but were just average. As for the pizza, it was clearly fresh, but didn't knock me over in the flavor department. Service was good, prices were fair, and I liked the look of the place (made us wish Tony & Pat's was still open). I also appreciated that this Leo's doesn't have the snobbish attitude of Leo's by the Slice. Brown's Country Buffet: A few weekends ago we were in the mood for a big Southern-style lunch. We had heard of Brown's Country Buffet in Alachua and decided to check it out. The buffet was smaller than I expected, but I still thought we were in for a good meal. Not really. The fried chicken was nicely done, as was the cornbread, but beyond that, nothing was memorable. Growing up in Louisiana (with time in southern Mississippi and having spent a decade now in central/north Florida), I've had my share of good country-style/Southern food and Brown's doesn't rank up there. That said, service was friendly, the price was reasonable (less than ten bucks a head), and the place wasn't hurting for business from the locals. For me, I'd rather pay more and have a better quality meal at Conestoga's on Main Street in Alachua. At some point, we should probably check out the Ivy House in either Williston or now with a new location in Alachua, too. Hopefully, it will be less than a month before I have time to check in again here. p.s. Tomorrow we're celebrating Valentine's Day a little early with a brunch at Blue Water Bay in Melrose. The owner of one of the antique shops in Micanopy swears by this place; we'll see. Mark's U.S. Prime: What a pleasant surprise. Traci took me here a few weekends ago for my birthday (being 30 feels the same as 29, but certainly seems "older"). Great experience. We've been to many of the "chain" steakhouses (Morton's, Ruth's Chris, Capital Grille, Palm, Shula's, Fleming's) and top-tier independents (Bern's and Charley's in Tampa), and Mark's compares very favorably. Our fillets were perfectly prepared (served on a sizzling plate of butter a la Ruth's), good service, good sides, nice environment. Our new favorite special occasion place in town. Mildred's was a nice experience, and Mark's is certainly more expensive, but worth it in my view. Louis' Lunch: Shifting to the other end of the price spectrum, we tried out Louis' Lunch for the first time a few weekends ago as well. Owned by the same family since it opened in 1928, Louis' may be the oldest restaurant in Gainesville. Louis Pennisi, the diner's namesake, lived to 106, passing away in 2003. Louis' has a run-down, step-back-in-time charm to it, which Traci and I love. One long-time customer we chatted with on our first visit appropriately called Louie's a "living museum" about old Gainesville. Old pictures line the walls. If you like homemade burgers, fries, onion rings, shakes and history, I recommend checking out Louie's while it's still here. Satchel's Pizza: Before moving to Gainesville this past summer, we had tried out Satchel's for dinner one night and had been impressed. I think the only reason we hadn't been back since was that Satch el's is on the other side of town, we knew there'd be a wait - and then we found Blue Highway Pizzeria in Micanopy, which is closer to us with little or no wait and very good pizza. Well, we hit Satchel's last night and were reminded just how good the salad and pizza is here. Prices are still reasonable, but certainly not cheap. Maybe I'll change my mind after eating at Blue Highway next time, but for now I think Satchel's edges out Blue Highway for best pizza in town. Pearl Country Store: A classmate turned me onto the Pearl Country Store, which, as the name implies, is a gas station/convenience store/barbecue joint. The barbecue isn't the best I've ever had, but is solid, the people are friendly (ok, they turned friendlier on our second visit), the prices are good, and Traci and I tend to like most places where you can sit up at the counter. You know you're in the country when half of the customers are wearing camo, everyone seems to know each other, and the girls & guns magazines are on sale at the front of the store next to the country jams and other homemade items. Pearl is right down the road from Blue Highway on US 441. No Good Cuban Sandwiches in Gainesville: I'm now pretty convinced that a good, authentic Cuban sandwich simply doesn't exist in this town. (For that matter, I haven't found yet a great deli/sandwich shop here, either. Hogan's is better than a Subway/Quizno's etc, but that isn't saying much). I've now tried Cubans at Virtually Cuban, La Familia, Mi Apa Latin Cafe and Flaco's. All of these places are fairly skimpy on toppings and/or use bread that might qualify for a Miami-style Cuban, but not a Tampa-style Cuban. La Familia gets their bread from Tampa, but was skimpy with the meat, cheese etc (plus, they have an Italian name/motif and use bread from Tampa, but no salami?). The only Latin restaurant in town I haven't tried yet is Emiliano's. Our favorite Latin place here by far is Green Plantain's. Agree? Disagree? Where are we missing? Send your Gainesville-area restaurant suggestions to: flfoodhound@gmail.com. As always, thanks for reading and happy holidays! 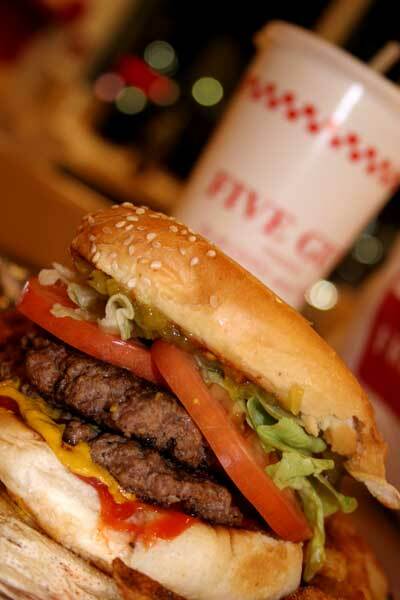 Five Guys Burgers: Good Burger, Change the Buns! This past Friday evening, we were in the mood for burgers so we decided to try out the new Five Guys Famous Burgers and Fries in University Collection Mall on Fowler near USF. 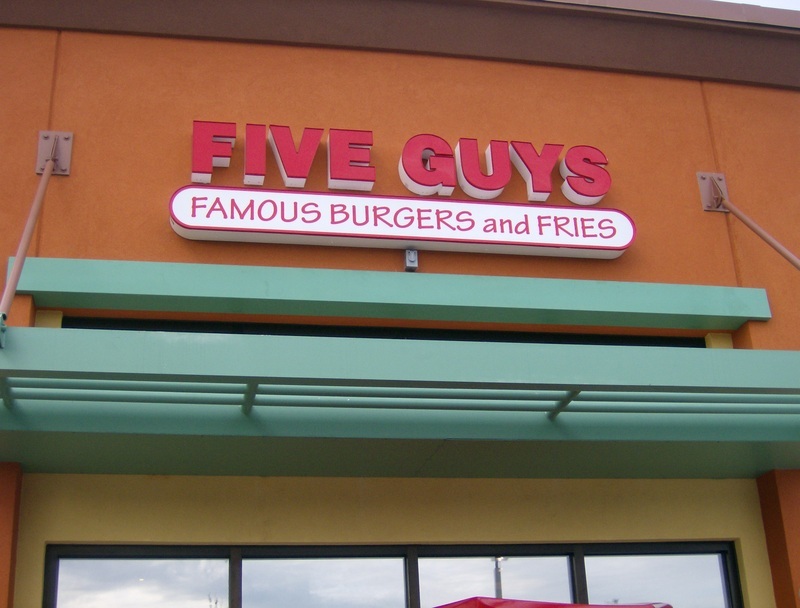 I had first heard about Five Guys a few weeks ago in an enthusiastic email from fellow Sticksian, Joel. Since then, I'd read another glowing review about the newly opened Tampa location of this award-winning and Zagat-rated Alexanderia, Va. based old-school burger and fries joint. When we arrived at Five Guys last Friday, we had the place almost to ourselves. The menu is simple - burgers, fries and hot dogs- no fancy combos or happy meals here. I decided upon a cheeseburger "all the way" (you get to pick from a mess of toppings at no additional charge) and Traci went with a hamburger with fried onions, relish, pickles and mustard. We also ordered a regular order of fries (cajun-style is also available), which we were told would be enough for two of us- it was and then some. Peanuts are available while you wait for your order to come up. While my burger was tasty, the real star was the french fries, which Traci and I both agreed are some of the best fries we've ever had. I learned later from reading the reviews on the wall that nothing is ever frozen at Five Guys and the fries are cut fresh daily. It sure tasted like it. As for my burger, the two beef patties were tasty and I liked the mix of toppings, although I'll skip the sauteed mushrooms next time. Our only complaint with our burgers were the flimsy buns. While I love a messy burger, the bun quickly fell apart. A toasted, firmer bun would have been much better. The counter service was friendly and everyone aimed to please. As we finished up our meal, business picked up. Five Guys is walk-in only. No drive-through. The Fowler location at least also serves bottled beer. 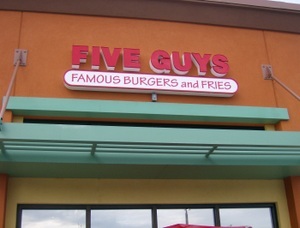 There is also a new Five Guys open at the Brandon Town Center Mall and one about to open on Kennedy and Dale Mabry. Additional locations are planned for Carrollwood, New Tampa, Riverview and Oldsmar. It remains to be seen if Five Guys can maintain its quality and uniqueness as it expands up and down the east coast with plans for 1,000 locations eventually. My favorite local burger remains the Chattaburger at The Chattaway in St. Pete, but in terms of fast-food burger joints (and I sort of hate to even put Five Guys in this category), it's hard to beat a burger from Five Guys. It's definitely worth giving a try. So what's your favorite local burger joint? Bottom-line: If you're looking for a no-frills burger joint that focuses on serving great burgers and fries at fast-food prices, but with home-cooked taste and freshness, Five Guys is worth giving a try. Inspection Scorecard: Last Inspection - November 2006 - Violations - Critical (3), Non-Critical (2). 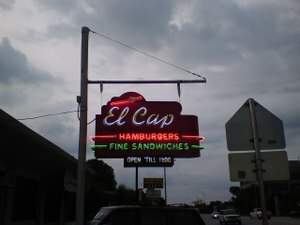 After enjoying my first dripping-good Chattaburger at The Chattaway last week, this past Saturday night my fiancee Traci and I headed to El Cap which, like The Chattaway, is well-known for its burgers. El Cap, which is located on 4th St. in St. Pete, also regularly makes the list of best burger joints in Tampa Bay. I had eaten at the well-loved neighborhood sports pub once before for lunch and came away happy, but hadn't put one of their burgers to the test. So naturally this time I went all out and ordered a cheeseburger with bacon and side order of fries to share. Traci went with a bowl of chili and crackers and the friends we were with ordered a burger, chili and a grouper sandwich. Like The Chattaway, my El Cap burger wasn't huge, but it was tasty and the fries were respectable. The chili, though, which apparently is a favorite of allot of El Cap regulars, was bland and didn't do anything for more. We've made better chili at home. I did get a kick out of the 8oz draft beers in their "mini-glasses" for just $1.20 a piece. Can't beat that. While our service was decent, we watched two other groups sit down at tables in the back near us, only to walk out a few minutes later after no one cleared their table or took their order. Granted the place was busy and there seemed to be only one server assigned to the room we were in, but this wasn't the "treat you like family" attitude I expected. On an unrelated side note, El Cap looks like a cool place to watch a ball game (the Rays-Yankees was on) with its worn baseball memorabilia covering the walls (try as they might most new sports bars just can't recreate this authenticity). Bottom-line: My Chattaburger was tastier, but my El Cap burger was still a winner- the same can't be said for the chili and the mediocre service. I'm sure I'll be back, but won't be in a rush. Inspection Scorecard: Last inspection March 2006, violations- Critical (2), Non-Critical (4).